While each mountain is unique, all Summit County ski resorts are known for their world class skiing and snowboarding, as well as the shops and restaurants to entertain visitors off the slopes. Breckenridge boasts four peaks for skiers and riders to explore in addition to the two lift-serviced summits that access terrain normally found only in the backcountry. With the greatest vertical drop in Summit County at 3,398 feet, there are equal options for skiers who are just learning to stand, and those who are learning to fly. 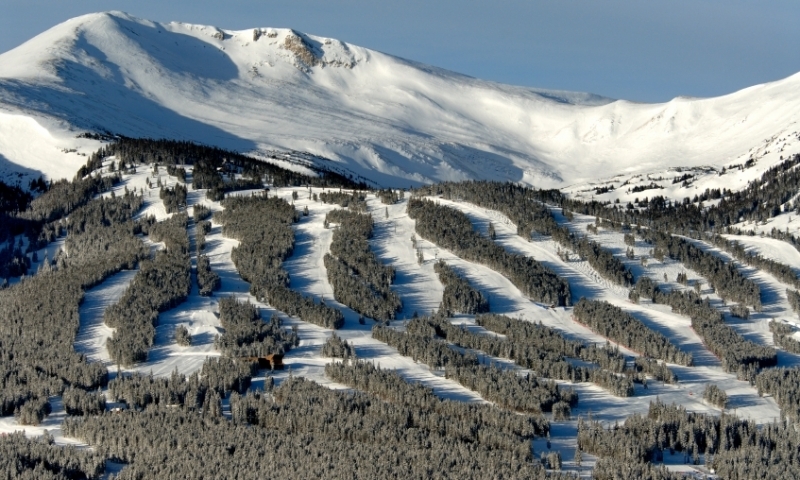 Breckenridge Ski Resorts open in the middle of November, remaining open until late April. Adult Ticket Prices are around $151 at Peak Season. Breckenridge is about 80 miles west of Denver and 70 miles east of Eagle County airport. With 3,148 acres, Keystone is the largest ski resort in the area, even extending its hours for night skiing on Dercum Mountain, the A51 terrain park, and the tubing hill. All this available terrain pushes skiers to explore farther and longer than normal, which makes the aprés-ski scene even better, with burning legs comforted by the sounds of live music and stories shared among fellow skiers and riders. Keystone's season runs from early November through the middle of April, weather dependent. Adult Ticket Prices are around $124 at Peak Season. Keystone Resort is located 70 miles west of Denver and 65 miles east of Eagle County Airport. Towering above other Summit County, Colorado ski resorts with a summit elevation of 13,050 feet, Arapahoe has some of the most challenging terrain in the area. Known as a skier's mountain, A-Basin is always presenting new challenges for its visitors to tackle. The Montezuma Bowl was recently opened, for instance, opening 400 acres of new terrain. Arapahoe is consistently one of the first resorts to open and last to close, with the season starting in October and lasting through early June. Adult Ticket Prices are around $100 at Peak Season. Arapahoe Basin is located on Highway 6, close to the Continental Divide on Loveland Pass. It is just shy of 100 miles from the Denver Airport, and 80 miles from the Eagle County Airport. Copper Mountain takes pride in being one of the most balanced mountains in the area. There are plenty of runs for beginners and intermediates at Colorado's Perfect Ski Mountain, and also runs for the advanced as well. The Village at Copper completes the package, with shops, restaurants, cafés and more. Copper's season starts in early November and continues through late April. Adult Ticket Prices are around $150 at Peak Season. Located 75 miles west of Denver and 20 miles east of Vail, Copper Mountain is easily accessible from multiple locations. Consistently the first resort to open the ski season, Loveland gets more snow than any other mountain in the area with an annual average of 400 inches. Combining great snow with a convenient location close to Denver, Loveland provides a perfect option for skiers and riders to tackle some great terrain without the longer drive times of other resorts. Early to middle October opening days are some of the earliest around, staying open until early May. Adult Ticket Prices are around $75 at Peak Season. Loveland Ski Resort is just 53 miles from Denver on I-70, located on the east side of the Eisenhower Tunnel. Rental equipment is available from the many shops located in and around the ski resorts. While Loveland Pass may be the most popular of the backcountry options, there are many others available as well. The White River National Forest has a trail system providing access to a large variety of terrain. See our Vail / Beaver Creek website for information about Beaver Creek Ski Resort. Crested Butte Ski Resort vacation information.